Konrad Mizzi and Keith Schembri. Tourism Minister Konrad Mizzi has taken to Facebook to claim the Egrant inquiry has “cleared” him of allegations of wrongdoing. In a video comment uploaded onto his personal Facebook page, Dr Mizzi said he was happy that the magisterial inquiry, the conclusions of which were published yesterday, had also cleared him and the Prime Minister’s chief of staff Keith Schembri. “On the Running Commentary website run by Ms Caruana Galizia, a number of lies had been made about the Prime Minister and his wife, about Keith Schembri, me, and others,” he said. 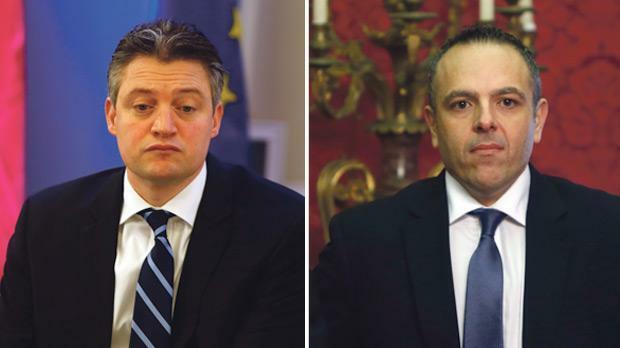 Dr Mizzi, who was the only EU minister to be named in the controversial Panama Papers leak, said he was happy for Prime Minister Joseph Muscat, his wife Michelle and his colleague Keith Schembri. He added: "I am happy that the lies said about me by Ms Caruana Galizia have been cleared too." Leaked documents also showed a total of €1.3 million had been transferred to 17 Black, a Dubai company listed as one of the "target clients" which would pay in money to Mr Schembri's and Dr Mizzi's once-secret Panama companies. Egrant Inc. is one of four related companies set up by consultancy, Nexia BT, for Dr Mizzi, Mr Schembri, and for a consultant, Cheng Chen of Accenture, all of whom were involved in the previously unannounced sale of shares in a key state asset, Enemalta, to a Chinese state-owned company, Shanghai Electric, shortly after the Panama companies were set up. Ms Caruana Galizia had reported in her blog that Dr Mizzi had received large sums of money from politically exposed persons. This, Dr Mizzi insisted in the video, was all a lie. “The inquiry concludes that I received no payments from politically exposed persons from Azerbaijan via Pilatus Bank, and confirms there was no corruption or money laundering,” he said. The minister added that on his part, he looked ahead to continue working to make the country “the best in Europe”. Meanwhile, the Caruana Galizia family have said when reacting to the inquiry's findings that the only reason the public knows that Minister Mizzi and Mr Schembri owned Hearnville Inc. and Tillgate Inc. was because their names appeared in leaked emails from Nexia BT to Mossack Fonseca in Panama. Without the email evidence, no Maltese magistrate would have been able to prove the companies’ ownership, they said. Later on Monday, the Nationalist Party said it disagreed with Dr Mizzi that the magistrate’s report had let him off the hook, however. It said in a statement that for a start, he and chief of staff Keith Schembri had two secret companies in Panama, Hearnville and Tillgate. The party said that while it accepted the report as it had faith in the judicial institutions, it nevertheless felt that the prime minister should shoulder political responsibility. It called for the Bugeja report to be published in full.